Earlier this week I posted about the possible discovery of a first century copy of Mark's Gospel. This was first reported by Pete Williams over at Evangelical Text Criticism. Dan Wallace announced the discovery of this manuscript during a debate with Barth Ehrman. Dan Wallace has since clarified what has been discovered and what it might mean for New Testament Studies. Here is what he said on the Dallas Theological Seminary website. On 1 February 2012, I debated Bart Ehrman at UNC Chapel Hill on whether we have the wording of the original New Testament today. This was our third such debate, and it was before a crowd of more than 1000 people. 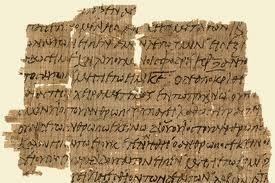 I mentioned that seven New Testament papyri had recently been discovered—six of them probably from the second century and one of them probably from the first. These fragments will be published in about a year. These fragments now increase our holdings as follows: we have as many as eighteen New Testament manuscripts from the second century and one from the first. Altogether, more than 43% of all New Testament verses are found in these manuscripts. But the most interesting thing is the first-century fragment.It was dated by one of the world’s leading paleographers. He said he was ‘certain’ that it was from the first century. If this is true, it would be the oldest fragment of the New Testament known to exist. Up until now, no one has discovered any first-century manuscripts of the New Testament. The oldest manuscript of the New Testament has been P52, a small fragment from John’s Gospel, dated to the first half of the second century. It was discovered in 1934. How do these manuscripts change what we believe the original New Testament to say? We will have to wait until they are published next year, but for now we can most likely say this: As with all the previously published New Testament papyri (127 of them, published in the last 116 years), not a single new reading has commended itself as authentic. Instead, the papyri function to confirm what New Testament scholars have already thought was the original wording or, in some cases, to confirm an alternate reading—but one that is already found in the manuscripts. As an illustration: Suppose a papyrus had the word “the Lord” in one verse while all other manuscripts had the word “Jesus.” New Testament scholars would not adopt, and have not adopted, such a reading as authentic, precisely because we have such abundant evidence for the original wording in other manuscripts. But if an early papyrus had in another place “Simon” instead of “Peter,” and “Simon” was also found in other early and reliable manuscripts, it might persuade scholars that “Simon” is the authentic reading. In other words, the papyri have confirmed various readings as authentic in the past 116 years, but have not introduced new authentic readings. The original New Testament text is found somewhere in the manuscripts that have been known for quite some time. These new papyri will no doubt continue that trend. But, if this Mark fragment is confirmed as from the first century, what a thrill it will be to have a manuscript that is dated within the lifetime of many of the eyewitnesses to Jesus’ resurrection! As I said in my previous post, it is important that this be handled with caution. The fact that Dan and others have not put this fragment on display prior to publishing it is a good sign that it will be handled correctly. I would also point once again to Larry Hurtado's cautions about how to handle this new discovery. In any case, it is still exciting to learn of the potential discovery of more ancient New Testament manuscripts.